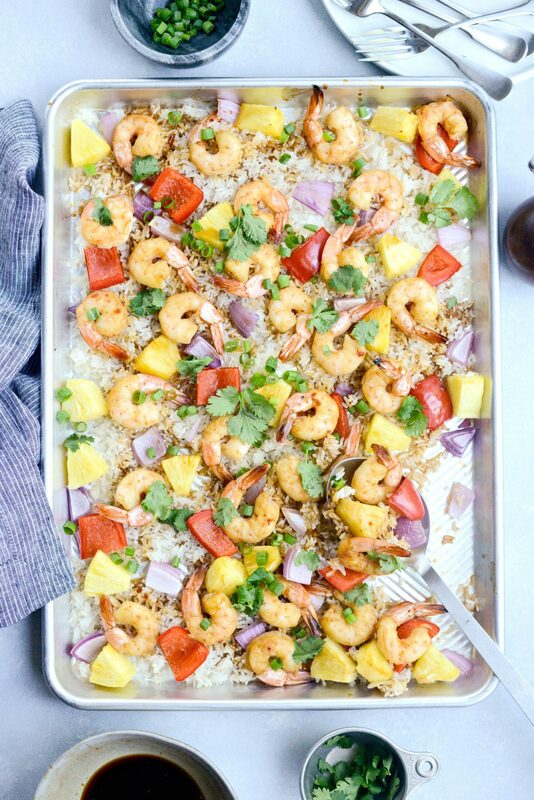 Winner-winner Sheet Pan Hawaiian Shrimp and Rice Dinner! 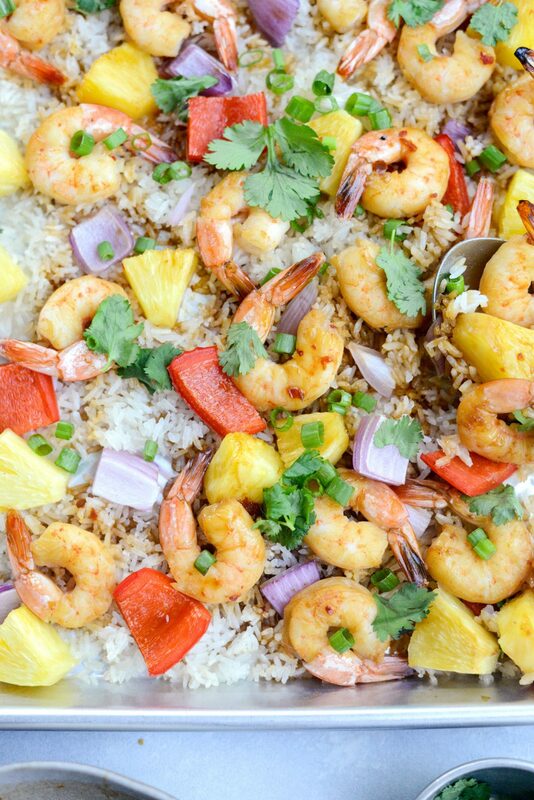 This easy dinner is exploding with Hawaiian flavors. 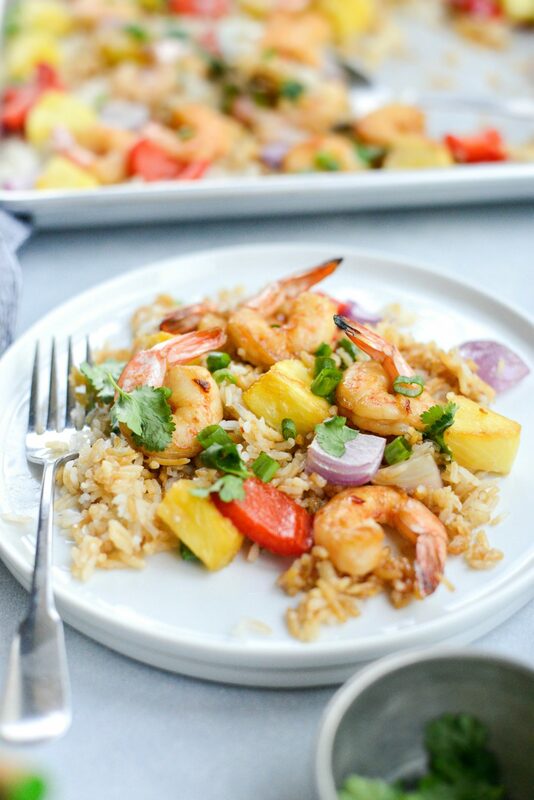 Red bell pepper and onions, sweet pineapple and perfectly cooked shrimp cooks with coconut rice for an easy and saucy one pan meal. 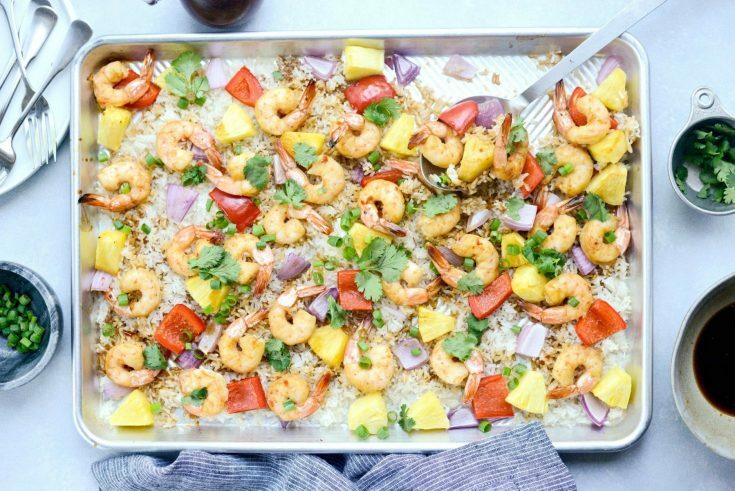 This colorful pan of deliciousness is what I call dinner heaven. One pan and done. Plus there’s the whole fact that Hawaiian flavors are present and basically anything coconut and pineapple is my food love language. So is butter and bread and anything with chocolate and marshmallow. Bonus points if it’s in ice cream. SO back to this dinner. 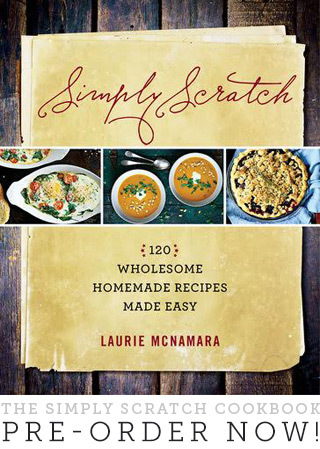 You must know this is one of the easiest and most delicious things I’ve made in a while. I know-I know, I say that a lot but YOU GUYS I sometimes make this just for me. Then I eat it all week long for lunch. The rice is coconut and toasty and tender. 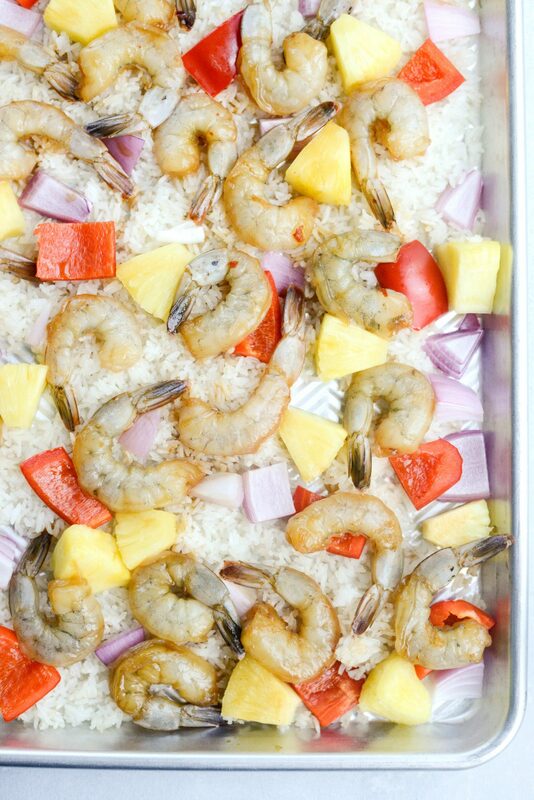 The shrimp are perfectly cooked alongside red onions, peppers and [my personal favorite] pineapple. 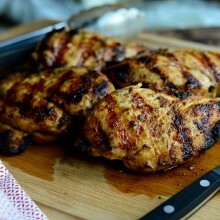 But the sauce that gets drizzle over top towards the end is simple and bursting with flavor. 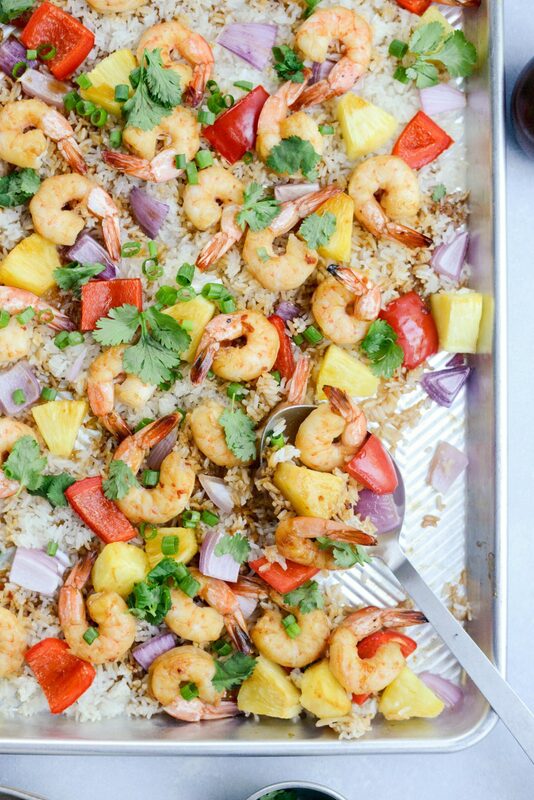 To make this sheet pan Hawaiian shrimp and rice dinner you will need 3 cups of leftover white or brown rice. 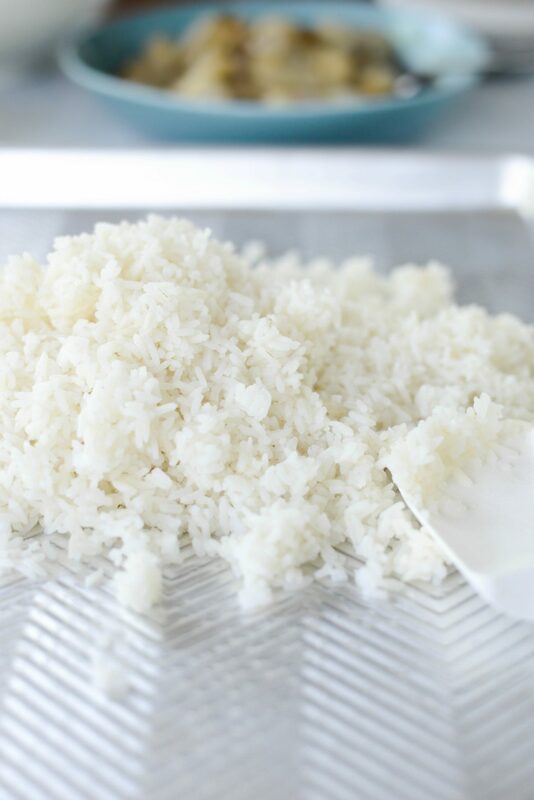 Fresh rice tends to stick more, so making some in advance or using leftovers is best. 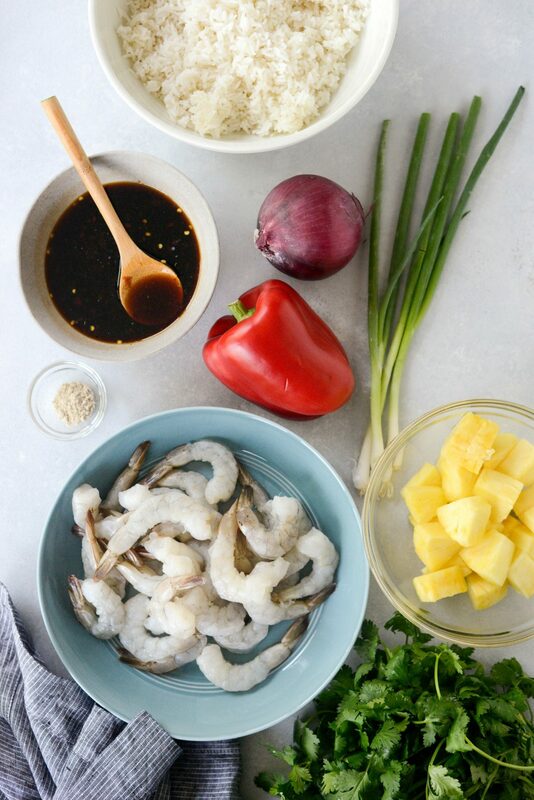 You’ll also need coconut oil, pineapple, red bell pepper, red onion, peeled and deveined shrimp and white pepper. 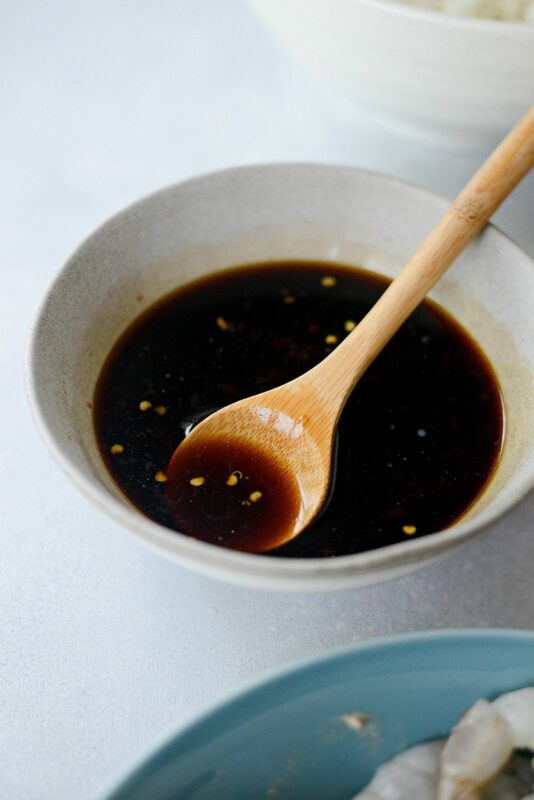 For the sauce you will need 1/4 cup low sodium tamari (or low-sodium soy sauce), 2 tablespoons oyster sauce, 2 tablespoons agave, 2 tablespoons shaoxing wine and 1 teaspoon chili garlic. 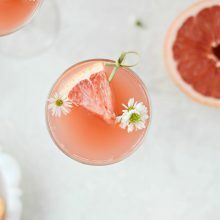 If I have a little pineapple juice I’ll add a splash or two, but totally optional. 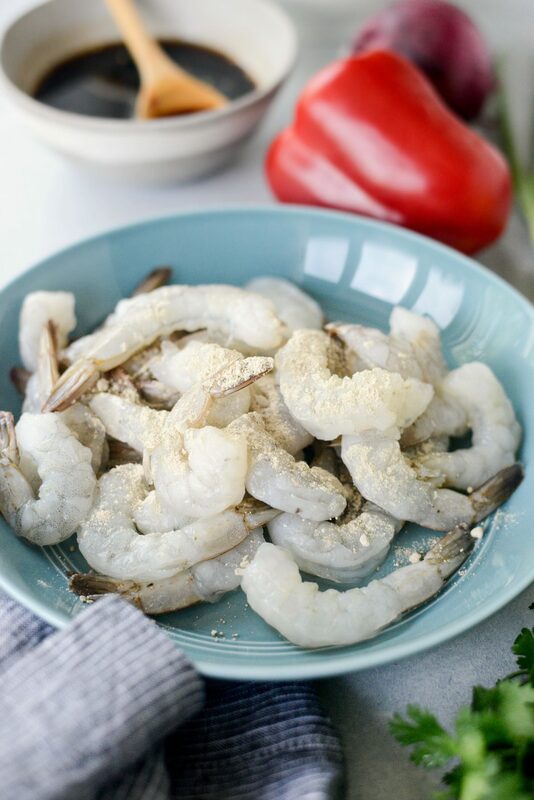 Next toss 1 pound of peeled and deveined shrimp (thawed if previously frozen) with 1/2 teaspoon white pepper. Pour in half of the sauce, carefully toss to coat. 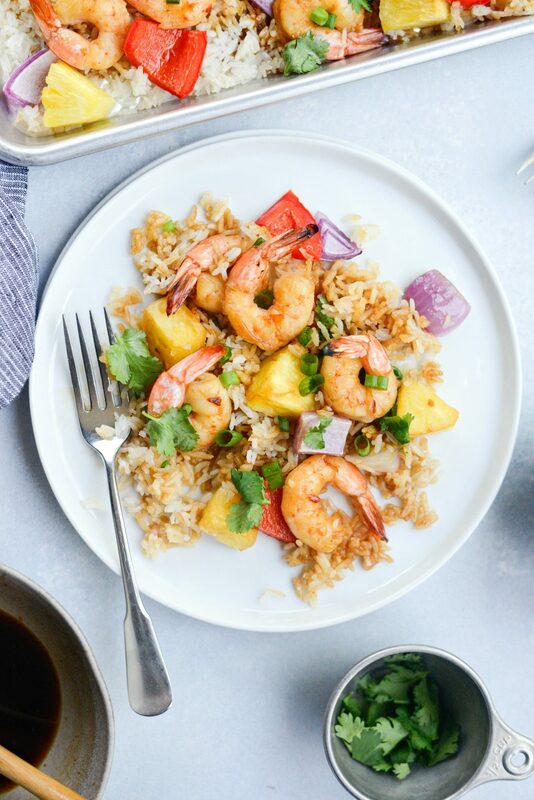 Then toss 3 cups leftover white rice with 2 tablespoons melted coconut oil and spread it out onto a rimmed metal baking sheet that has been sprayed with (non aerosol) or wiped with a little extra coconut oil. 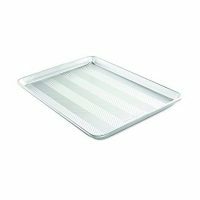 Slide the pan onto the middle rack of your preheated 450° for 6 minutes, rotating the pan halfway through. 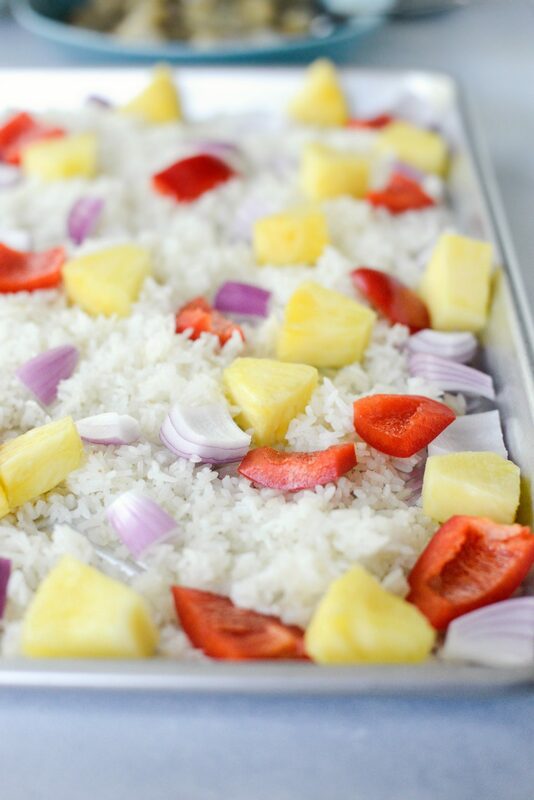 Fluff and toss the rice before spreading it back into an even layer and topping it with diced pineapple, red onion and red bell pepper. Slide the pan back into the oven for 8 minutes. 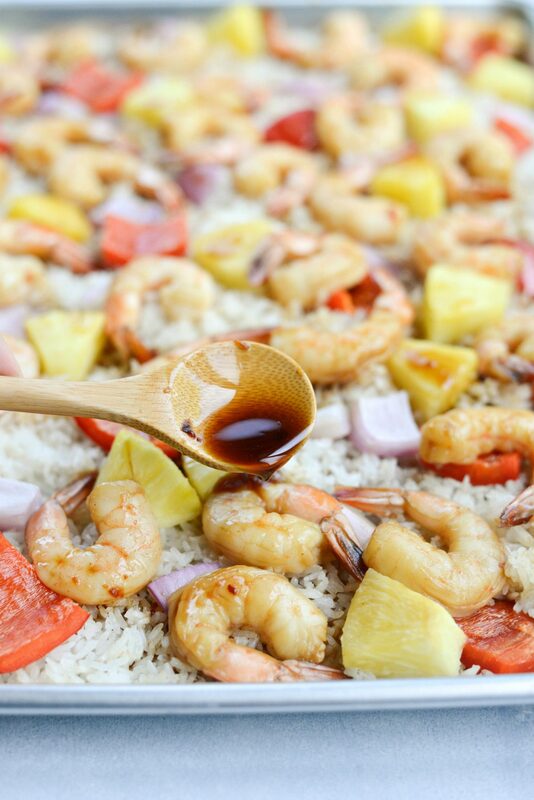 Remove the pan and top with the raw shrimp discarding the sauce in the dish. Bake for 5 minutes, before drizzling with 1/2 of the remaining sauce. Rotate the pan halfway before sliding the pan back in the oven for 5 more minutes. That’s it! 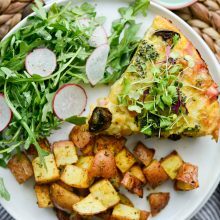 Sprinkle with sliced green onion and cilantro leaves before serving. Scoop and serve on plates with extra sauce on the side. Delicious doesn’t even begin to describe this. So delicious. 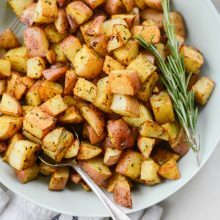 In a small bowl whisk sauce ingredients and set aside. Preheat your oven to 450° and spray a large, rimmed metal baking sheet with coconut oil. 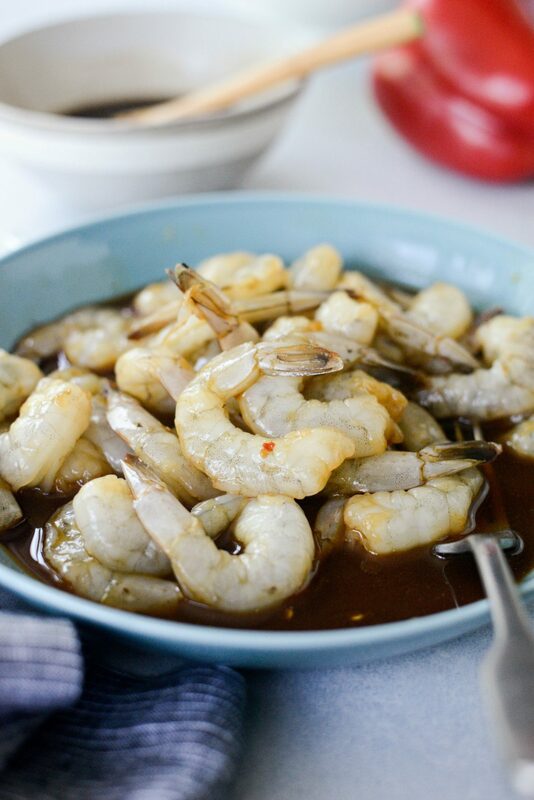 Toss the shrimp with white pepper and 1/2 of the sauce. 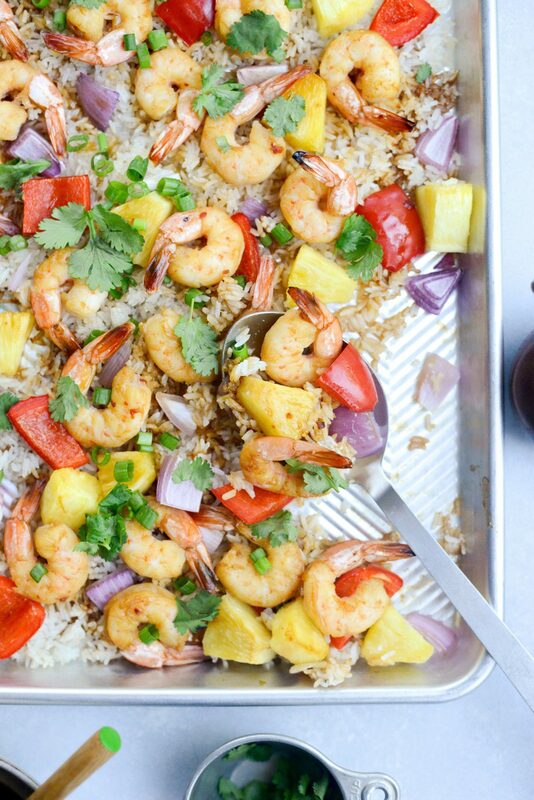 Pour the coconut oil over the leftover rice and spread it onto the prepared baking sheet. Bake for 6 minutes, rotating the pan halfway through baking. Remove, toss and spread out evenly before scattering the pineapple, red onion and bell pepper over top. Bake for 8 minutes. Next add the shrimp (discarding the sauce in the dish) and bake for 5 minutes. 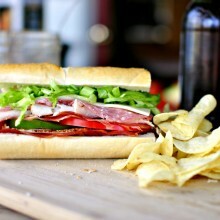 Remove and drizzle with 1/2 of the remaining sauce before returning the pan to the oven to bake for 4 to 5 more minutes. 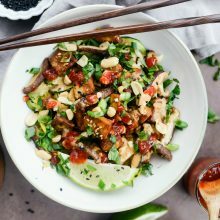 Top with sliced green onion and cilantro before serving with extra sauce on the side.